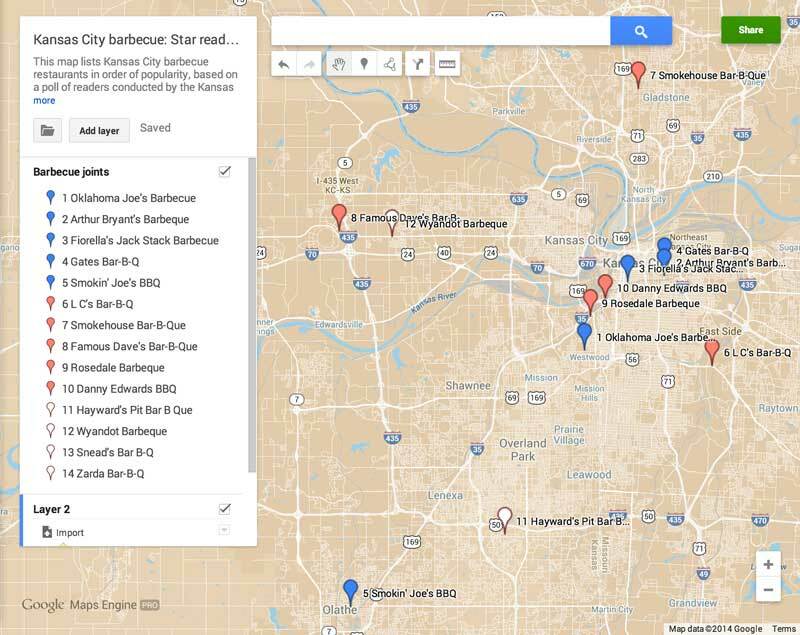 data visualization | Michael Fuhlhage, Ph.D.
Don’t know where to find the best barbecue in Kansas City? Google Maps Engine to the rescue! The Kansas City Star recently ran the results of online poll asking where to find the best barbecue in the metro area. Only problem is, it didn’t tell where to find them. So I threw together a map using Google Maps Engine Pro while I prepared a step-by-step visual guide on making interactive maps for my multimedia journalism students. I was pleased to see so many options I knew nothing about, despite my always being open to trying new ‘cue joints each time I’ve returned to see family and friends in the place where I grew up. Locator maps were a staple of the infographics diet when I was a print journalist. Bar charts and fever graphs were also pretty typical. Illustration was seen as pretty exotic. But locator maps were and continue to be important for mid-sized and large metro papers because city geography can be complicated, and we can’t always expect our readers to know much about neighborhoods far from their own. That shortsighted view was a symptom of a text-centric orientation of a “reporters’ newsroom.” Yet designers in more visually oriented newsrooms, like the ones where I learned the craft at the St. Cloud Times, Lawrence Journal-World, The Desert Sun in Palm Springs, and the Santa Fe New Mexican, know photos and infographics are the reader’s gateway into the page. We also know EyeTrack studies have shown information from infographics is more likely to be read, retained, and potentially acted upon. But you could only fit so much into the space of a print infographic since real estate on the printed page was at such a premium. That’s why I love the new tactics of online data visualization, in which the first layer provides general information and orients the reader to the subject, giving them points to click to find deeper information. That’s the logic of the graphic generated with Google Maps Engine, which is easy for the reader to use and relatively simple for journalists to use to create content. Unfortunately, WordPress.com does not make it easy to embed Google Maps Engine maps. Please, add your comment asking WordPress to add this functionality to this forum. Meanwhile, I hope you enjoy this sample of what Google Maps Engine can do: Kansas City barbecue: Star readers poll results. Oh, and if you want to see something that might get your blood up AND show you how handy Google Fusion Tables can be for blending numerical and geographic data, here’s a map showing how each state compares in terms of combined state and local sales taxes. Alabama, which has a reputation as anti-tax, actually has one of the highest combined state and local sales tax rates in the United States. That’s as I suspected, based on every time I’ve made a Costco run and been bitten by Montgomery’s sales tax, which combined with state tax is 10 percent.